If you’re reading this article it either means you’re continuing on from my introduction of “The Ten Essentials” or you fell down a rabbit hole on the internet googling compass techniques or something along those lines; either way, I’m happy you’re here. For those of you who have no idea what The Ten Essentials are, feel free to hop back to my intro on the matter. For those of you who are ready to dive into the first system on the list, let’s not waste anymore time! The Navigation System is number one out of the ten on the list, which means it’s obviously very important. The navigation category is generally assumed to mean bringing a map and a compass. Those two items are so important that they were originally the number one and two spots on the original list. Now there are many different ways to include these two items in your own setup, everything from GPS Watches to Hiking apps would fill this role, but their reliability can change drastically depending on the type of outdoor adventure you are planning. Let’s jump into some detail and start with the map. A map is actually one of the few things in your ten essentials list that will change most often. Unless you’re hiking the same area on every single trip, you are most likely going to build up quite a collection of them as well. When I really wanted to start branching out with my hikes I ended up turning to guide books as my go to map source, and I believe it was the best and least intimidating way for me to start. I figured why keep searching for hikes online and paying for apps or reading reviews when I could just buy one book with dozens of hikes all planned out and, what do you know, it comes with a map that can be used for every single one! It took so much pressure out of planning and it marked off half of the first system in the process. Later on of course you will branch out even further than what your guide books can provide and you will start planning on your own routes. That’s really where I’m at right now in my own hiking journey, so I can’t speak to anything further down the line than that, but right now I like to focus on State and National Parks. There are generally many well made map options for State and National Parks, from reliable manufacturers, but also sometimes from the parks themselves. If the parks online resources don’t provide maps, they usually will atleast give you a list of recommendations for accurate planning. Accuracy is obviously a very important quality for a map when planning a trip. So even when you begin to amass a collection of mapping resources don’t get lazy. Make sure you check for updated versions from time to time. There’s nothing worse than planning a route and finding out a whole trail doesn’t even exist anymore. Obviously you don’t need a fully realized topographic map when you’re going for a hike in the park by your house, I’m tempted to say that a print out from a local website will do just fine. Just make sure you have the information you not only need, but are comfortable using. Comfortability is really where the next part of the navigation system comes in as well. You have a compass on your phone's map app, your smart watch, and maybe even on your car's rear-view mirror, but that doesn’t mean anything unless you know how to use it when you’re lost. 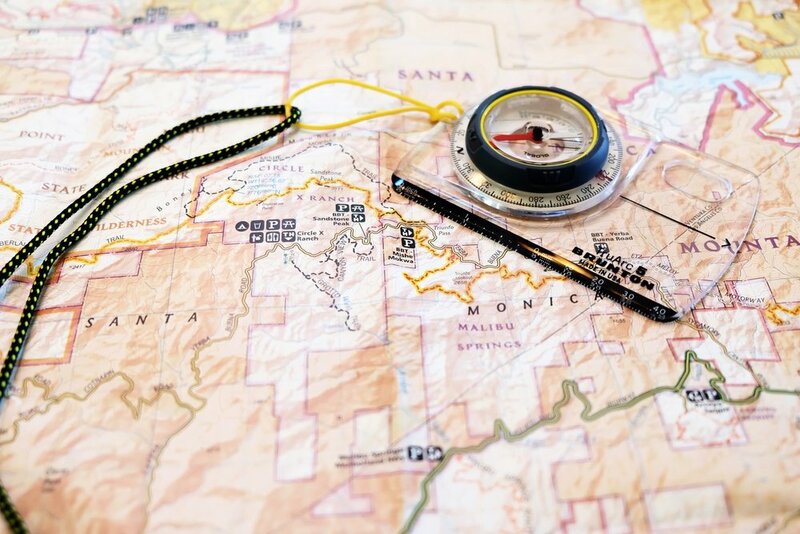 Realistically, the goal is to know how to use it in conjunction with your map well enough, so that you don’t get lost in the first place, but it's even more important once you are lost. Personally I don’t have much practicalexperience with a compass in the wild, but I have practiced enough that I am comfortable to use it if I needed to. I mostly rely on my watches GPS features when I’m hiking and I’ve been known to use google maps on occasion as well. But I would be a fool if I didn’t realize that batteries die and phones lose signal, so I also have an old school magnetic compass as well. So long as your compass is declinated (calibrating your compass for the discrepancy between magnetic and true north based on your location) it won’t fail you like technology might. Buying a good compass now is a simple investment that will pay itself back far into the future. It will never need to be updated like the maps, and unlike an iPhone it won’t get outmoded every single year. Just like with the maps, be reasonable. I’m not saying you need a highly advanced compass to walk your dog out in the woods. If your phone is charged and you’ve got a signal then go for it. But realistically there’s nothing wrong with keeping a compass in your daypack. Also if you are planning on doing any trip and are bringing a map with you, then definitely bring that compass. The two together are greater than the sum of their parts. I use this book all the time, but I still don’t use it anywhere near enough. Most of these hikes are within driving distance for me so they can easily be done on my days off. This is also the guidebook I was referencing earlier. This edition comes with an awesome pull out map that can be used for everything in the book and more. I haven’t really had to use this compass on trail yet, but I have it with me and I do know how to use it if I needed to find my location and get home. I decided to purchase this compass specifically because I found that it's features and functionality were no more, or less, than what I needed for its affordability. My two go-to sources for free maps and guides. If you are anywhere where these two sources are relevant than I can’t recommend them enough. Both are responsible for getting me out on the trail more than any other resource. If you find that there isn't much use for these apps in your area, just keep searching, there are many great online resources. That’s about it for my take on the Navigation System so if you liked this post let me know in the comments and feel free to share any of your own gear suggestions as well. I plan to continue these articles regularly so I will be putting in my two cents about sun protection the next time this comes around.